In my previous article i have given the difference between SQL and PL SQL. In this article i will try to explain the Difference between SQL and TSQL. 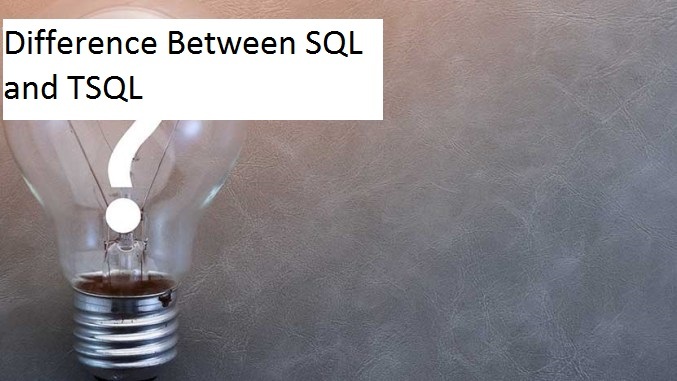 The both are related to Microsoft SQL Server.You might have question regarding ‘What exactly should be difference between SQL and TSQL ?’ if these both are related to the SQL server database.In this article i would like to give you bullet points as well as Difference between SQL and TSQL in tabular format so that user can understand it step-wise. We all know that SQL and TSQL are the two sides of a one coin named Microsoft SQL server.The SQL stands for Structured Query Language where as TSQL stands for Transactional Structured Query Language. The SQL stands for Structured Query language which is mainly used to issue or execute a single query with insert/update/delete/select. User can not be able to execute multiple statements at a same time. TSQL stands for transactional SQL which is used to do the different transactional activities in SQL server programming. User can use multiple programming techniques while using TSQL. The SQL statements are mostly used to create analytical reports,web pages and screens. The SQL statements are used in supporting applications also. If user wants to update something in application then simple sql statement needs to be fired from support team. The best use of SQL statement are in to reporting techniques. TSQL is transactional sql which is used to perform back-end transactions of application with using multiple programming techniques. TSQL is mainly used to add the business logic to specific program. It is used to build the application logic for specific application. SQL is the Structured Query Language, the ANSI/ISO Standard database language. SQL Server’s implementation of the language is called Transact-SQL (T-SQL). SQL is the Structured Query Language. it is developed by IBM. TSQL is the Transact SQL. it is implementation of the SQL server. it is developed by Microsoft. TSQL is used in writing the procedure and some advanced concepts are written by this. SQL is data oriented language which is mainly used to process and analyse the data using simple queries like insert,update and delete. TSQL is transactional language which is mainly used to create the applications as well as will use to add business logic in to application from back-end systems. SQL is simple used to write the DDL statements as well as DML statements. TSQL is used to write procedures,views,functions,triggers. These are called as TSQL objects. The sql statements are simply executed one statement at a time. The TSQL statements are set of different sql statements. These are executed one after another. SQL statements are also called as declarative statements. The SQL statements tells the database what to do but not able to tell the database how to do the things? TSQL is transactional language which tells the database about how to do the things. You can embed SQL in to TSQL but can not embed TSQL code in to SQL. These are above some important bullet points of Difference between SQL and TSQL. In next section i will explain the difference between SQL and TSQL in to tabular format. SQL Stands for Structured Query language in which single SQL statement is executed at a time. PL SQL stands for Procedural Language Structured Query Language which is used as programming language in databases. SQL simply used to perform DDLs (Data Definition Language) and DMLs with using single query at a time. TSQL is nothing but set of SQL statements which are used to do the step by step transactions towards database. SQL is called as declarative language which is used to define what needs to be done. TSQL is called as transactional language which is used to define how the things should be done. SQL executes as a single statement at a time. TSQL can execute bunch of statements at a time using different programming features like looping and if else statements. The main use of SQL statement is to process and manipulate the data. The SQL statements are mainly used for reporting purpose. TSQL statements are used to perform the transactions to the databases. TSQL is mainly used to build the application logic. SQL is a programming language which focuses on managing relational databases. T-SQL is a procedural extension used by SQL Server. No way to use same name for any kind of s/w or organization. Oracle follows ANSI/ISO-sql standards and they their own sql-commands so it is called Oracle-sql. Therefore Oracle=ANSI-sql +Oracle own SQL commands+SQL*plus commands + PL/SQL. Similarly SQL server=ANSI-sql +Microsoft own SQL commands i.e TSQL +TSQL Programming (similar to Oracle PL/SQL). sql server is using tsql as programming language. oracle is using sql, and plsql as programming language. The above table gives you difference between SQL and TSQL. Hope you get the idea about difference between SQL and TSQL. If you like this article or if you have any questions regarding this article kindly comment in to comment section. I have added your difference point with your name in article. Thanks for suggesting this new point.